William Dunton. Occupation Therapy: A Manual for Nurses (Philadelphia and London: W.B. Saunders and Co., 1918), 156. There are times when difficulties in book repair can cause me to become a nervous convalescent…….. This makes me giggle. I love the stuff you post. 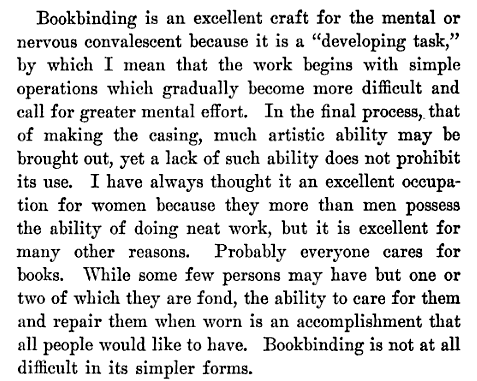 While not necessarily mental or nervous, I recall one or two of the smaller British manuals I have mentioning that bookbinding was a suitable craft for disabled veterans of the Great War and similar. The projects within were often desk sets and file organizers, things most manuals no longer describe and many binders today would find challenging if only because unfamiliar. I’ll have a look at home in the next day and find some examples. I wrote my graduate thesis on using bookbinding in art therapy. Bookbinding, in both process and product, offers amazing therapeutic possibilities. Bummer I didn’t have this resource back when I was doing my research – it would have been a great find. Is your thesis online anywhere? I’d be interested to read it. I would also be very interested to read more about bookbinding as therapy, since I have recently founded a charity that does just that – using bookbinding as therapy for wounded Servicemen. We are training them with a view both to achieving qualifications and to manufacturing items for retail. Trials last year have shown it to be successful in both respects, although the charity is as yet a very modest enterprise. The charity is called “The Wiltshire Barn Project” (a bit of a working title at the moment) registered in UK as number 1149583, and is working hand-in-glove with the Services’ Personnel Recovery Centre at Tedworth House in Wiltshire (managed by Help for Heroes in conjunction with the Services). Website and contact details are being developed right now in order to go live on the net shortly. 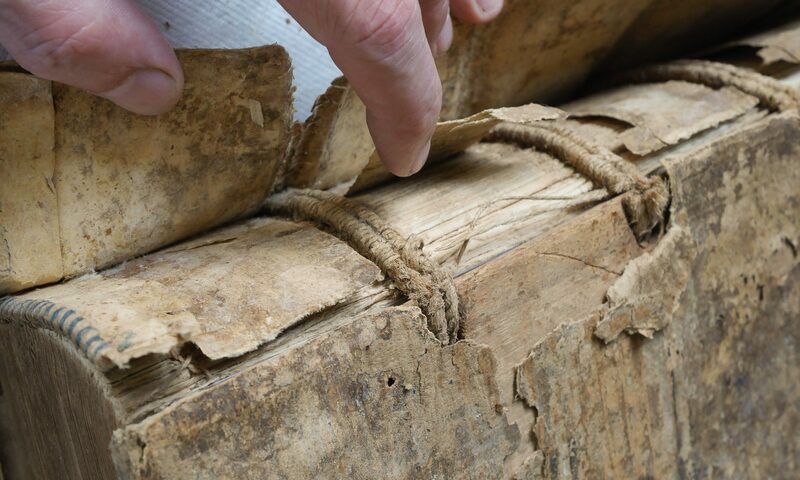 Any studies or comments on bookbinding as therapy would be most interesting and helpful as we seek wider support amongst other Service charities and sponsors. Ones duty to go beyond sym/empathy with the maimed/physically disabled and to help them into avocations that can provide for them. Mention of homes and workshops to help in this healing process, most with workshops to serve the young and adults. Does make point to mention that none of these are veterans, but those who were maimed such as losing an arm in work related accidents and may still be of school age. The Zeitschrift für Krüppelfürsorge, Heft 5/6, 1927 describes in an illustrated article by Dr. Proebster how young people can be prepared for the bookbinding trade. Only one of the apprentices as a fore-arm stump, the others have upper arm stumps. Cited is a Dr. Biesalksi who “says that the best prostheses is the stump,” or the stump still contains a certain amount of strength and mobility and facilitates the use of prosthetic devices. However, prosthetic devices are limb replacements, not replacements for limbs. [Depiction of prosthetics being used for bookbinding]. 12 further illustrations depict one-armed individuals sewing, round and backing using German press with “press nut,” laying on gold for edge gilding, covering a spine, paring leather, and tooling.